Sripraphai has gained popularity over the past few years for having the most authentic and affordable Thai cuisine in Queens. A restaurant like Sripraphai may seem out of place being that it's located in a manufacturing neighborhood in Woodside, but its location doesn't deter people from paying regular pilgrimage to it. Sripraphai usually draws a big crowd during the weekends so expect to wait outside the restaurant among other hungry patrons waiting for their numbers to be called. The good news is that they opened up a second restaurant on Hillside Avenue in Long Island. Not as convenient to get to if you don't drive but probably less of a wait for a table. People are always asking me for recommendations on what to order since I've eaten here on numerous occasions whenever I'm craving for Thai. 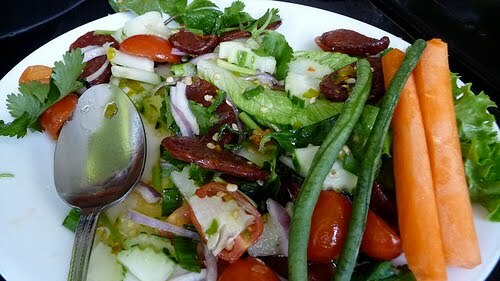 I always start out with their sweet sausage salad with cucumber, onions and lime juice and it always tastes amazing; the flavor is indescribable. It's almost as if this dish is frolicking with the taste buds in your mouth. It has a combination of the sweet and savory taste of the sausages and the refreshing and citrusy taste of the onions, cucumbers and lime juice. People who don't normally eat at Thai restaurants usually tend to stick with what they know, such as Pad Thai as their main entree. The Drunken Noodles and the Pad See Ew are both very good alternatives. Both dishes are prepared by sauteing the noodles with vegetables and a choice of meat, but they look and taste completely different. What I miss the most is their fried tilapia topped with tamarind sauce. They stopped making this dish a while ago and I never found out why that is. If they ever bring this dish back, I'll go back every week just for it. Sripraphai has finally added a dessert section to their menu. It also comes with pictures too. Yay! Before they changed their menu, people used to have to walk to the refrigerator by the main entrance to figure out what they wanted for dessert, it also didn't help that the labels on the desserts were all in Thai. For dessert, definitely get the lychee sorbet topped with lychee. I'm not sure why they put "lychee meat" on the menu. It can be a total turn-off for people who don't even know what lychee is. The only thing foodies should know about Sripraphai is that it's closed on Wednesdays and they accept cash only. And if they ask you how spicy you want your food to be, go with mild. The chilies that other cuisines uses are unmatched with the chilies that Thai cuisine uses. I made the mistake of ordering the Jungle Curry dish spicy and my whole mouth went numb. If you want to be able to taste your food, I would stick with mild.